Several feminist art archives to be preserved and accessible thanks to new grant. 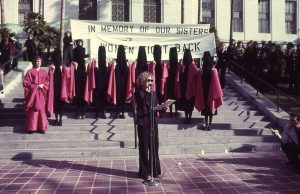 In 1973, artist Judy Chicago, designer Sheila Levrant de Bretteville, and art historian Arlene Raven changed the cultural landscape by founding the Woman’s Building in downtown Los Angeles. For two decades the Woman’s Building played a crucial role in the national women’s movement, shaping both the field of feminist art and American arts education. 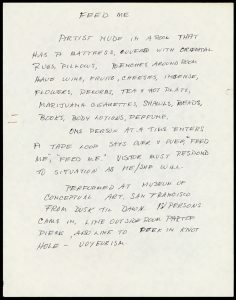 Each collection in this project is valuable on its own terms, from the Woman’s Building records and videos to the archives of several feminist artists and artist groups who were active at the Woman’s Building, including Nancy Buchanan, Barbara T. Smith, Faith Wilding, Feminist Art Workers, Mother Art, Sisters of Survival, and the Waitresses. But considered together, they illuminate—in strikingly poignant ways—major initiatives, struggles, and dynamics of the women’s movement from the 1960s to the twenty-first century. As reflected in its archives, the Woman’s Building was not just a physical structure. It was also an innovative educational institution and an organizational center for the feminist movement. Rather than painting and sculpture—media championed by traditional art schools—the FSW curriculum emphasized video, writing, performance, and graphic design. The Women’s Graphic Center and the Los Angeles Women’s Video Center, located within the Woman’s Building, offered opportunities for training, experimentation, and self-expression in new media. 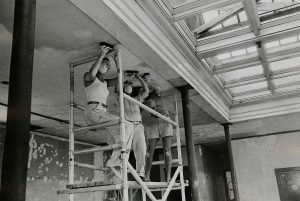 The archive of the Woman’s Building as an organization offers an overview of the building’s activities from its founding until it closed in 1991. Contents include announcements, posters, manuscript material, and thousands of images of exhibitions, readings, performances, and the building itself. Over the years, several feminist artist groups emerged from the Woman’s Building. Their archives, many of which were donated to the Getty Research Institute by the artists themselves, reflect the range of artistic approaches that stemmed from the idea of collectivity that was so central to the Woman’s Building. 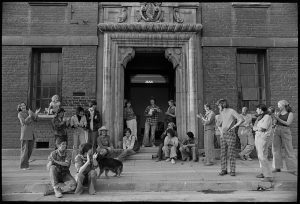 In 1973, the artist collective Mother Art was formed by FSW participants to address practical needs, such as childcare at the Woman’s Building, and to produce sociopolitical art projects focused on pressing issues such as immigration, abortion, and homelessness. The Feminist Art Workers, formed in 1976 by Angelo, Compton, Cheri Gaulke, Laurel Klicka, and later Vanalyne Green, incorporated feminist pedagogical techniques in participatory performance art. In 1977, Jerri Allyn and Anne Gauldin cofounded the Waitresses, a performance art group that used humor to explore issues related to women’s labor, with a focus on topics that still resonate today, including sexual harassment, stereotypes, and wage inequality. Sisters of Survival, an anti-nuclear performance art group founded in 1981 by Allyn, Angelo, Gauldin, Gaulke, and Sue Maberry, toured and collaborated with other anti-nuclear activist groups throughout the United States and Europe. Ready to Order? 1978, The Waitresses. 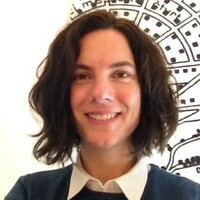 Photo: Maria Karras. The Getty Research Institute, 2017.M.45. Gift of Jerri Allyn and Anne Gauldin, The Waitresses. The archives of individual artists who contributed to the Woman’s Building present diverse perspectives on the women’s movement and the intersection of feminist activism and the visual arts, particularly in Southern California. Faith Wilding was one of the inaugural members of the Woman’s Building, and her archives reflect the diffusion of West Coast-based feminist art and theory throughout the United States. The papers and videos of Nancy Buchanan, a pioneer of performance, video and conceptual art, show how feminist artists used art as a tool for raising awareness of contemporary political and social issues. 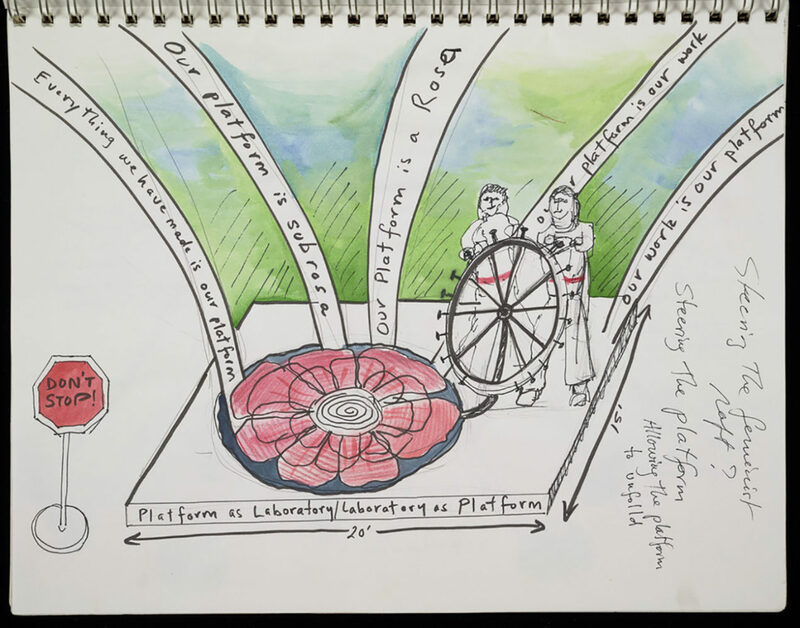 Drawing of Rosa/Subrosa platform, 1979, Faith Wilding. The Getty Research Institute, 2017.M.8. In addition to documenting the history of the Woman’s Building, the collections are also rich resources for the study of performance art, video art, and the history of art in Southern California more broadly. Thanks to the Save America’s Treasures grant, the Getty Research Institute can accelerate processing and preservation of 11 archives, and digitization of materials most at risk of deterioration. Speedy completion of the work is particularly important given the salience of the collections to current events in the United States and ongoing activism around women’s rights. Grant-funded digitization efforts will focus on acetate and magnetic media that are at particularly great risk of deterioration. These include thousands of photographic negatives and slides, several hundred audio and video recordings, and more than 40 film reels. Because fluctuations in temperature and humidity can be quite harmful to acetate film and magnetic media, storing them in a climate-controlled environment is critical to their preservation. Digitization of this material will allow us to make digital versions available for research, while the originals remain safely in storage. 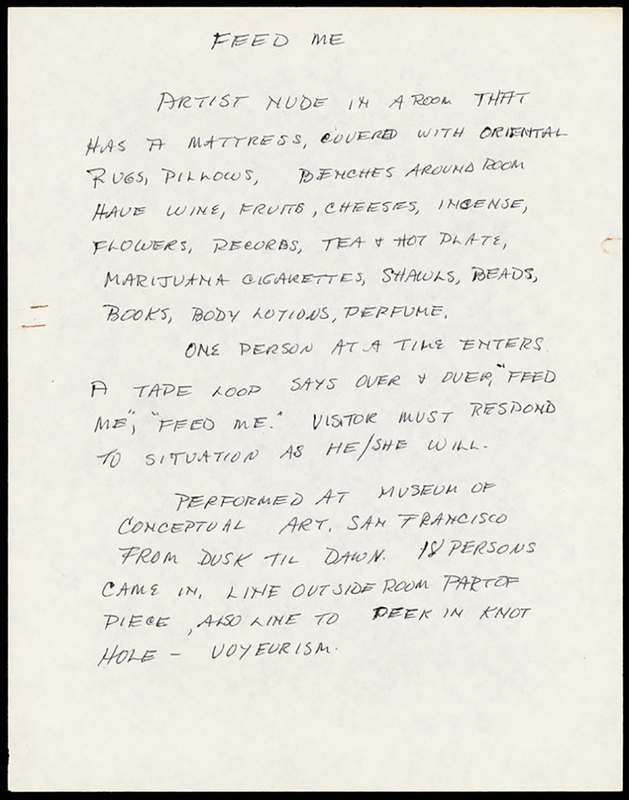 The digitization project will also include critical films and audio and video recordings from the papers of Barbara T. Smith, an influential figure in the history of feminist art and performance art in Southern California. While much of her archive is already available for research, these items have been unavailable due to conservation concerns. The two-year project begins in December 2018 and ends in November 2020. Once processed and preserved, all of the archival collections will be freely accessible for research. To get announcements of the completion of processing and digitization of each collection, follow the Getty Research Institute Facebook page or subscribe to our e-newsletter. Lucy Lippard, “Forward: Going Around in Circles,” in From Site to Vision: The Woman’s Building in Contemporary Culture, eds. Sondra Hale and Terry Wolverton (Los Angeles: Otis College of Art and Design and the Woman’s Building, 2011), 12. Jenni Sorkin, “Learning from Los Angeles: Pedagogical Predecessors at the Woman’s Building,” in Doin’ It in Public: Feminism and Art at the Woman’s Building, eds. Meg Linton and Sue Maberry (Los Angeles: Otis College of Art and Design, 2011), 37. 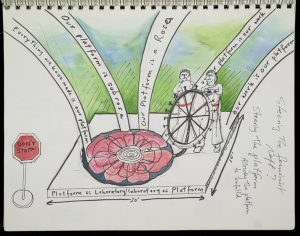 “Timeline,” the Woman’s Building, accessed October 29, 2018, http://thewomansbuilding.org/timeline.html. The timeline on the Woman’s Building website includes a fairly comprehensive list of exhibitions, performances, video art, literary events and educational programs from 1968 to 1991. This entry was posted in Architecture, Art History, History, Women. Bookmark the permalink.